anthropologist. The state agency FEMORS was there to assist with the remains. MARIANNA, Fla. -- Boot Hill Cemetery is giving up its secrets. A team of researchers from the University of South Florida has begun excavation work in an effort to uncover 100 years of mysteries buried at the cemetery at the shuttered Dozier School for Boys. Anthropologists and archaeologists -- led by Associate Professor of Forensic Anthropology Erin Kimmerle and Associate Professor of Archaeology Christian Wells -- began the meticulous work Thursday. Graduate students from USF and a crew of volunteers worked through the Labor Day weekend to excavate the first two burial sites. They carefully removed layers of soil to reach the remains, which were approximately 3-4 feet below the surface. The work follows last year’s discovery by USF researchers of at least 19 graves more than the 31 originally believed to be in the Boot Hill cemetery. Lifting the dirt, sifting and carefully carving around the remains, researchers gathered artifacts from the coffins as well as fragments of remains. Researchers were able to determine that both boys were between 10 and 13 years old. To the trained observer, the grave already yielded information. Based on the measurements of the first set of remains recovered, Kimmerle estimates the boy's stature was about 5-foot-2. "He was wrapped in a burial shroud, we found shroud pins and the coffin had some elaborate, decorative hardware on it, so we were able to recover all of that. Even a little bit of wood fragments, which was unexpected but the preservation was good," Kimmerle said. Every artifact discovered was collected and will be brought back to the labs at USF along with the remains to help determine the time of the burial as well as possibly identify the boys. The team has been working for more than a year on the Boot Hill cemetery, using Ground Penetrating Radar (GPR) analysis to map the burial ground and analyzing soil samples to determine where the unmarked graves are located. Last month, researchers received permission from the state to conduct the excavation in an attempt to identify the boys using DNA. Ten families have come forward hoping to find their loved ones buried on the grounds at the former Dozier School for Boys. Researchers have already collected DNA from three families actively searching for their brothers and uncles who were sent to the school more than 60 years ago and never returned. Kimmerle is encouraged by what the team is finding on the first excavation trip, which was complicated by wet soil in the burial areas, which slowed the work. 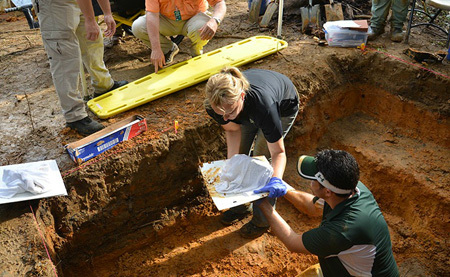 Wells explains how the monumental effort involves collaboration from many different state agencies and describes the methods the graduate students will use once the remains are in the lab at USF. "The students are using a method called block excavation, blocking out sections of the human remains that are still intact in the soil, lifting them out together with the soil and packaging them up," Wells said. "All of the remains will be brought back to the anthropology labs at USF, where we'll meticulously, in a controlled environment, excavate those remains from the soil and begin to analyze them." The research will continue throughout the next year, including several more trips to the site to excavate the remaining burials.